At fifty-plus, I’ve finally discovered my tribe. And paddleboard yoga. I read this article and found it very interesting, thought it might be something for you. The article is called A Widow and her Galentines and is located at http://modernloss.com/a-widow-and-her-galentines/. A year after my husband George died I unrolled my yoga mat in a new studio that specialized in vinyasa yoga. I was lonely and looking for things to do. My husband and I had been anti-social introverts—he was a software engineer happy to be alone with his computer and with me, relieved to be out of meetings at the end of the day. I was happy to be with my books and him. When he died, I didn’t have a network of friends to fall back on, and much of the time I was alone. At the studio, I picked a back corner, hoping I wasn’t taking anyone’s usual spot. Unfamiliar with this yoga style, where you try to “flow” between poses, I spent the next hour and fifteen minutes falling over, lurching and generally galumphing instead of flowing. But I kept going back because I loved the classes. They took me out of my widow’s brain and into the moment, trying to match movement to breath, to transition between positions without stopping, to surrender instead of forcing my body into the poses. By the end of each class, sweat dripped from my hair but my nervous system WAS calm. The anxiety had been wrung out of me and I’d been comfortably stretched out. After a few weeks, I noticed a group of women in the studio, about my age WHO all seemed to be friends. There was a health conscious, brunette super mom, a wild-haired artist in camo-print leggings, a statuesque blonde gardener, and a curvy, strawberry blonde with a sweet smile. Most were very good at flow yoga and my awkward attempts and dripping sweat was embarrassing. I thought they’d be cliquish, a holdover from my high school days in P.E, but these women turned out to be friendly. And they weren’t all married. Some were divorced; one was widowed. Several had been alone for a long time, but that hadn’t stopped them from traveling or going out. I admired them, wishing I were more independent. Our conversations were unremarkable. But the effects weren’t. I’d tried attending a bunch of groups before: the Rotary Club, a synagogue women’s group, a car club and several events on meetup.com. Nothing had resonated and I’d given them up. But after a few months at the yoga studio, I had people to talk to when I went to class. Over time, I learned about their problems with demanding relatives, overstuffed schedules, or bitter divorces. They learned I was a widow trying to adjust to a new life. When they went for drinks after class one evening, they invited me along. Another time, one of the teachers who I had befriended told me her own story of loss over coffee at the local farmer’s market. About a year into my yoga classes I was invited to an impromptu dinner at one of their homes. Soon, I was included in the group’s parties and drinks nights. Way too nervous over doing something so simple, I hosted my own holiday party. Everybody came! These days we see each other pretty regularly. 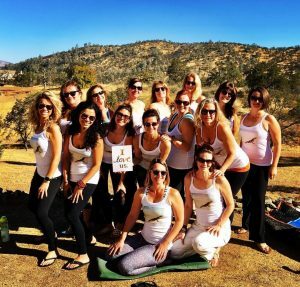 We do yoga retreats. Those of us without husbands get together over weekend dinners. My new single friends showed that I, too, can travel on my own. I discovered paddleboard yoga. At fifty plus, I finally have my first tribe. And that’s made all the difference. This is my fourth Valentine’s Day without my husband. My unmarried friends and I are planning “something Un-Valentine’s Day” together. Much of my residual anxiety has dissipated, with time and yoga and my tribe. George would be happy about that. I know I am. Debbie Weiss is a former lawyer, yogi and widow living in the San Francisco bay area. She blogs at thehungoverwidow.com, and her work has appeared in publications including The Huffington Post, Good Housekeeping, and Elle Decor. She is currently writing a memoir and anti-advice manual on widowhood. Find Debbie on Facebook and on Twitter @DkweissWeiss.